Hohenschwangau Castle or Schloss Hohenschwangau is a 19th century palace in southern Germany. It was the childhood residence of King Ludwig II of Bavaria and was built by his father, King Maximilian II of Bavaria. 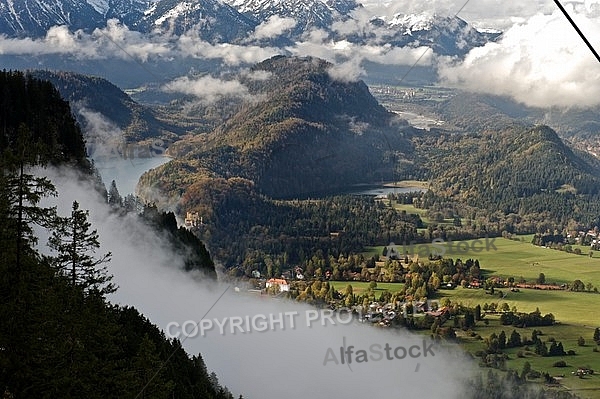 It is located in the German village of Hohenschwangau near the town of Füssen, part of the county of Ostallgäu in southwestern Bavaria, Germany, very close to the border with Austria. Hohenschwangau Castle was built on the remains of the fortress Schwanstein, which was first mentioned in historical records dating from the 12th century. A family of knights was responsible for the construction of the medieval fortress, and it served as the seat of the local government of Schwangau. In 1523, the schloss was described as having walls which were too thin to be useful for defensive purposes. After the demise of the knights in the 16th century the fortress changed hands several times. The decay of the fortress continued until it finally fell into ruins at the beginning of the 19th century.